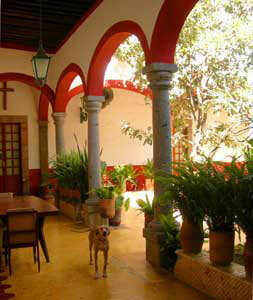 DOG and Bruiser hanging out in San Miguel de Allende, Mexico. Sushi, a Ridgeback mix and Alberto. Much is built with stone. 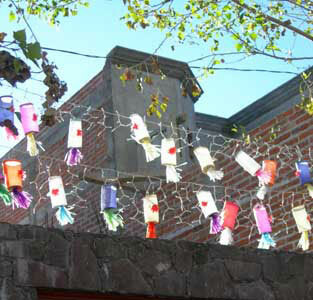 Paper lanterns for the New Year festivities. 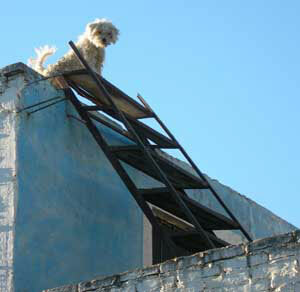 On a roof, this dog regularly made use of the ladder with far-apart steps to gain a better view and bark at us. 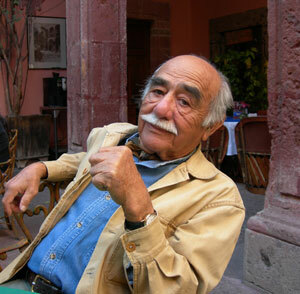 Pedro in Hotel La Siesta. Dixie, Pedro and I before lunch. 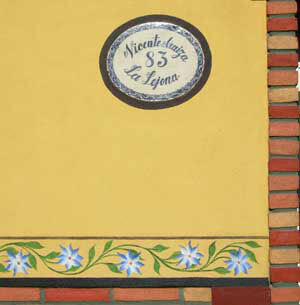 Each house has its own special name and plaque. We encounter four stray dogs on our morning walk. Two of the dogs I'd seen separately yesterday. Today they are together and follow us at a respectful distance. I wonder if they want to join our pack but when we make a sharp left, they continue straight. When we cross the main road to return home, I don't put the lead on Bruiser. 'Of course he's not going to rush out into traffic,' I think, and feel silly I hadn't trusted his judgement earlier. The van HAS to get fixed. I can't keep driving without front-end work. But I don't want to sit out in the open for the next ten hours. Despite incredible resistance and whining, I take the van in for repair. I walk the dogs back to the RV park and try to settle. I feel homeless. I put Bruiser on a lead. He whines. I feel I'm the one on a lead. The retractable lead continually wraps itself around his legs and he stumbles like an animal caught in a trap. All he wants is to explore. An hour later his whining is incessant and I take him for a walk around the grounds. Again I try to settle down. I don't succeed. After over an hour, I dig out the Cadbury's chocolate I bought in Texas and devour six squares, and then eat a salad. I'm incredulous how ill at ease I am without my 'home'. Now I understand why people seemed confused when I tried to travel like this with a Jeep Wrangler. "How on earth did I write out in the open with my laptop?" I wonder. Eventually I settle into a writing routine and on our afternoon walk, I stop in to see the mechanic. He's a gentle and soft-spoken young man who lived in San Antonio, Texas for seven years. He says the work has gone smoothly and is delighted to tell me the van will be done by the end of the day. I'm delighted. And not totally convinced. I return with money I withdrew without problem from an ATM machine inside Pollo Feliz, a fast food chicken restaurant. It appears the work is just being finished. But he tells me with a crestfallen face, that in fact the parts which were sent, aren't the right ones. He'll contact me when the right ones come in the next day. I'm not upset. But I decide tomorrow will be my day and even if the parts do arrive, I won't return the van till the day after. Before sun-up, the dogs and I set off on a walk and only use a lead once for Bruiser when we cross a main road. Two dogs lean out from a window in a construction site and bark furiously at us before they spot their owner and then they begin wagging their tails furiously and we're forgotten. When we encounter stray dogs on the street, there seems to be a mutual respect though wariness they all share. There are no squabbles. I know if we were in America, Dog and Bruiser would've tried to dominate them all. Hand painted Calla lillies motifs wrap around the exteriors of homes, not unlike the strips of mass-produced wallpaper sold at Home Depot that people glue below the ceilings of their kitchens and bedrooms in the US. 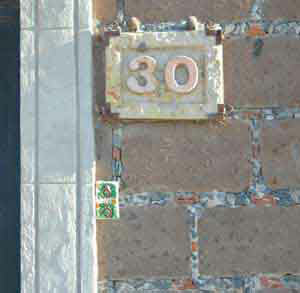 Wrought-iron grates placed over windows for security are shaped into imaginative patterns instead of plain horizontal and vertical bars. It seems the philosophy of the town is, "Instead of just having a door, why not have a beautiful door." Each individual house is a work of art. And I'm not even in the older part of town. All around me are new buildings and all have the same attention to detail as their older counterparts. 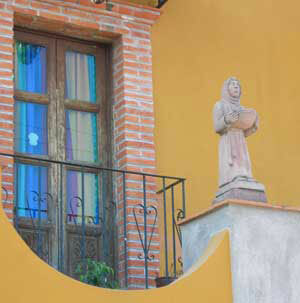 The entire town has been declared a national monument by the Mexican government. After settling the dogs in the van, I embark on a trip to the market to buy supplies. This is my first time into town during the day and I'm surprised at how many elderly Americans roam the cobblestone streets with me. I go to Pedro and Dixie's apartment but they're not home. Instead, a maid cleans the stone floor around the center water fountain while a man sells blue jeans in the entrance way. I buy bread from a bakery, placing my choice with a pair of tongs on a pizza tray. An attendant tilts my choice into a paper back and says, "Cinco pesos-cincuenta" for me to tell the money collector. I have no idea how much that is, but repeat the number religiously until it's my turn to pay. I hand the woman a 50 peso note, ensuring I get change and don't have to look like an idiot. I notice many of the Americans do the same. 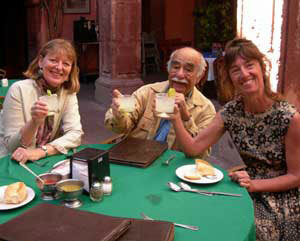 It's there I meet a woman from Florida who travelled to Egypt and Kenya before settling in San Miguel de Allende fifteen years ago. She's a bit tottery on her feet and reminisces about the good old days when only a thousand Americano's lived here. I wonder if she is a vision into my own future. A few hours are spent finding a place to get the van's front end fixed. The quote is half the price I was given in the US. The job will take 1 1/2 days and they won't let me sleep in the van overnight, but agree I can take the van after 7:30pm and bring it back in the morning. I don't like the idea, but there's not enough time to look for a place to rent. They order the parts. The young couple heading to South America are leaving tomorrow, so they have a little party in front of their RV. About 20 of us gather in a circle and drink run and fruit juices made from fresh pineapple. The dog owners and myself discuss dog behavior ad nauseum, just as parents discuss their children's foibles. It's a thoroughly enjoyable get-to-gether. I feel part of a transitory family. I wake up at 5am, far too early after only getting to sleep at 1am. I wait until daybreak before taking the dogs onto the streets. Despite trepidation, I don't use leads, only putting bandanna's around their necks to alert passersby that they're not stray. This is what I've been waiting for, a time when I don't have to worry about cats being attacked by my dogs. With so many dogs on the streets, no feral cats would survive. 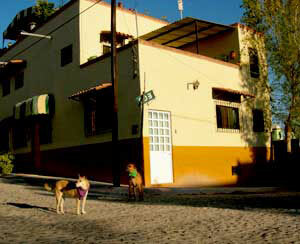 Half way down the block of the first street we enter I see seven stray dogs frolicking and playing together. Once they see us they begin barking and approach slowly. Bruiser, who for the past two years has dominated almost every dog we've come into contact with, whimpers. "OK, we don't have to go that way." We ease away from that street and go down another. Back at the campsite, I chat with Joseph who I'd met the day before and give him a book on colloquial Spanish. Far too advanced for me, I'm happy to lighten my load, and he's delighted to have it. As we stand talking, Bruiser rushes off. 'Uh-oh...' I think and quickly close the van door on Dog and run in Bruiser's direction. A huge cat and Bruiser are having a stand-off. Sam is owned by a couple in their 80's who've been on the road for 20 years, despite having a home they never live in. I rush towards Bruiser and grab his collar and drag him back to the van. New rule: in the RV park around American dogs, I need a lead. 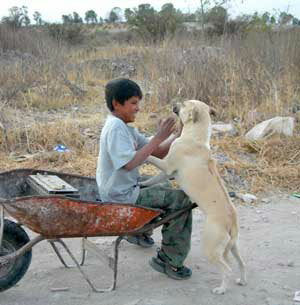 With the Mexican dogs, no lead. In the afternoon, most of the RV park occupants have gone to a New Year's Day party and I sit with Joseph and chat about travel, books and life. All the dogs and the one cat are safely inside their owners RV's so I take Bruiser and Dog off their leads. I feel wonderfully relaxed. An amazing way to begin a New Year. All I want is a shower and after settling the dogs in the van, I head to a unattractive yellow block of a building. Sitting nearby with two dogs is a young woman. By her is a motorcycle with Arizona plates. Amy and her new husband Aaron are planning a 1-2 year tour of Latin America, with the aim of volunteering where they can. 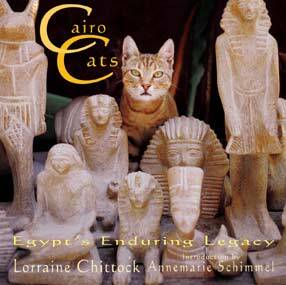 At her father's request and because he was paying her university bill, she gave up her dream of being an Egyptologist. At her husband's wishes, she's given up her dreams of being an archeologist and is now playing with photography. I loan her my two books and debate whether or not to tell her and her ex-Marine husband that doing magazine assignments sometimes involves being away from home for months at a time. I decide to mind my own business. 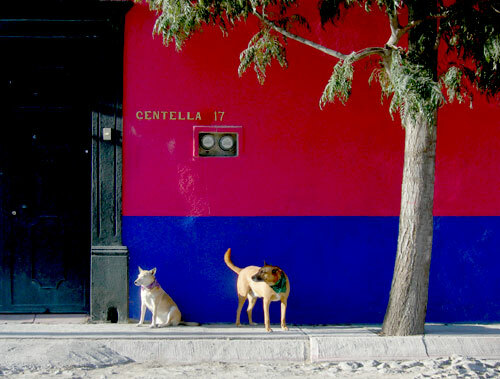 ~A retired Graphic designer and her retired real estate appraiser husband and their near deaf collie Allegre, which means happiness in Spanish. ~A couple who've worked with NBC and Disney and their black poodle Hugo. They've produced a DVD entitled "RVing in Mexico" and are currently working on a sequel. Click here for info They have a satellite dish on their Winnebago they let others use. I'm envious. I'd like a miniature version of their set-up to make communications easier with editors and friends. ~A retired Canadian language professor who lived in France for a year and who now regularly spends his winters in Latin America. This winter he'll travel to the Yucatan to learn more of the Mayan language and culture. ~A couple in their 80's who despite recently buying a house, only live in it six months out of the year. They've enjoyed a nomadic lifestyle for twenty years. She's a retired occupational therapist and he was in in the army in World World II. ~An American couple who are retired teachers, now photographers who now do exhibitions of their work. Previously, they spent a year sailing from the Great Lakes down to the Bahamas island hopping. They have a Ford Econoline Van. ~A Texan couple who have an Australian Sheepdog. ~A German couple in their mid-40's who are computer specialists who've taken two years off to travel across Canada, the US and down into South America. They're six months into their journey. In the next few days, a number of people in convoys of huge bus size RV's come and go. There are five white vans including mine, though mine is the oldest by far. I feel I've made a good choice. Though on the small size, the white reflects the heat and the vans are relatively inconspicuous. Late afternoon I take the dogs for a walk. There are dogs everywhere. 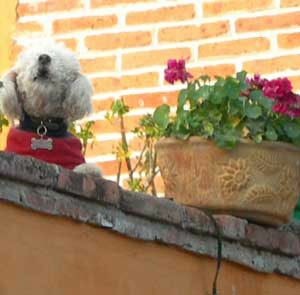 Two poodles clad in green and red festive coats bark at us from a balcony. Two huge Rottweiller mixes slather at us from behind wrought iron doors. We spot stray dogs in the distance. Only in New York city have I seen so many dogs in one place. 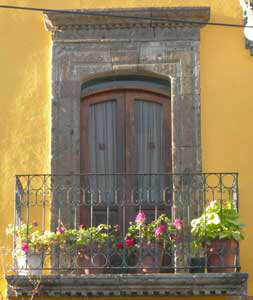 Barking echoes off buildings painted pink, purple and deep ochre. As sunset approaches, the sky turns magenta and the buildings are shrouded in a soft glow. In the evening, I call my friends Dixie and Pedro. 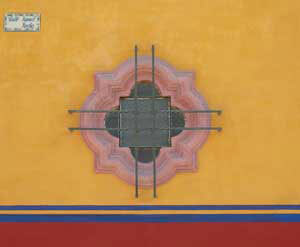 Pedro is 88 years old and was once Frank Lloyd Wright's main photographer. I'm exhausted and want nothing more than to go to bed. But I don't want to miss out on the festivities so I let myself be coerced into coming to Plaza Principal or called Jardin for Garden, a block from where they're staying and where fireworks are scheduled. As luck would have it, two retired teachers are also going and we share a bus ride to the square. We meet up with Dixie and Pedro outside a Dunkin' Donuts shop. But the facade is rough stone and blends in wonderfully with the cobblestone that paves the narrow streets and the buildings which look like they've been imported from Europe. The three of us roam. Lines outside nightclubs consist of trendy teens and twenty-something locals interspersed with a few American teenagers. Adults and children everywhere hold sparklers almost three feet long. Outlawed in the states when I was a child because of the danger in getting burned, I'm delighted to see them again. We walk into a restaurant with hundreds of candles burning. A stone stairway winds up to the patio above against the far stone wall. Above us is the sky. It looks like a Medieval castle. "Magic," we all breath. At midnight, we stand in front of the Parroquia de Nuestra Sonora de Dolores, a church with a 18th century Churrigueresque facade. 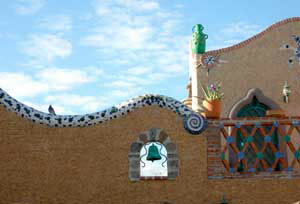 Suddenly, bells toll from inside its Gothic-like spires which can be seen for miles around. Fireworks explode directly above us and the sky is awash with colour. This continues for what seems an hour, but is only 15 minutes. Moments after each explosion, we're showered with faint debri. 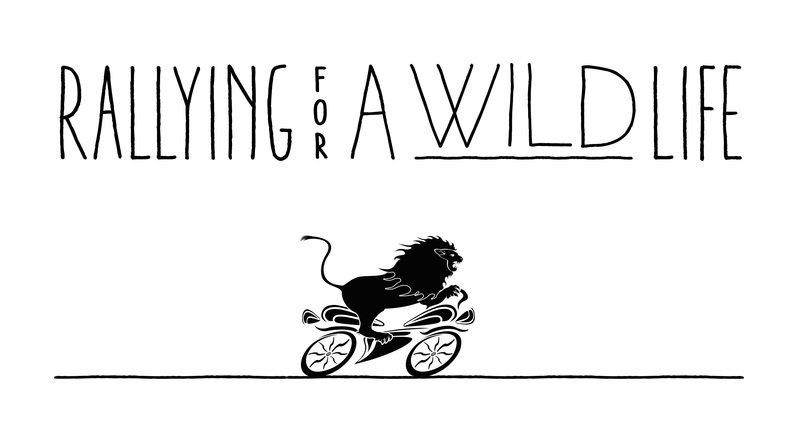 Despite the danger, no one gets hurt and there's no fear of lawsuits. America seems a world away. I drive. I drive some more. I drive still more. Other than when getting gas, I speak to no one all day and in the evening find a dirt track amongst cactus. I worry about dreaded cholla cactus thorns getting into the dogs and so I carry tweezers with me, a habit I began in Arizona. But they've remembered and we leave the next morning unscathed. I wake and the demon inside has passed. I feel great. Fog covers the scene, and my van is completely obscured. After our walk, the dogs frolic around freely for the first time in months. They're happy, I'm happy. Both are immediately covered in dust and mud. It's a small price to pay. I make my last phone calls to friends and we cross the border. Nothing is clearly marked but there's people who've made numerous trips back and forth who are more than happy to assist. I check my cell phone. Instead of reading T-Mobile, it says 'Mx TelCel'. "That's it doggies. We're on our own." But despite my sudden isolation into a world where I know less than 30 words of Spanish, my overwhelming feeling is, 'I've done it! I've crossed the border.' And, there's an even bigger success. I've been in the US for two years and seven months and despite a number of close encounters, there isn't one less cat alive because of my dogs. I can now relax. No longer will the dogs have to continually be on leads. 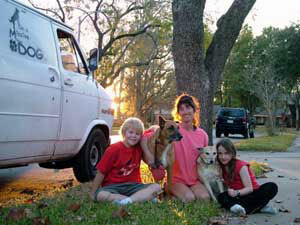 Dog and Bruiser were once semi-feral and I'm eager to see how they re-adapt to the freedom they once knew. 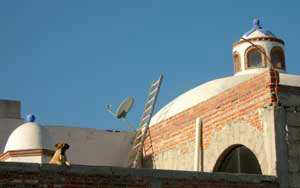 In towns where there are cats in Latin America, of course they'll have to be on leads. But usually where there is a large feral dog populations, cats don't survive. Because I'm wanting to be in San Miguel de Allende by New Year's Eve, and because just before leaving the states a mechanic had shown me the warning signs of some front-end problems in the van, I pay exorbitant fees for the privilege of traveling on fast, smooth roads. I'm filled with low-grade apprehension. After three hours of driving the engine begins to splutter-a fuel problem. "I just had a new fuel pump put installed in September," I say in an effort to defy what seems inevitable. "That mechanic must've given me a bad fuel pump. I knew there was something about him I didn't like..."
One of the downsides of the toll roads is there are few if any exits and no towns. They are long, excellent roads with scenery you can't stop to explore. It is the worst place to breakdown. However, about 50 yards ahead on the other side of two one-way lanes of streaming afternoon traffic is a gas station. I'm hopeful, though I know the times are gone when a mechanic and map taped to the window was a feature of gas stations in America. I fear it's the same in Mexico. I approach an attendant and say, "Mechanico?" I only hope this is the word for mechanic. He points to a police car parked a short distance away. One of the police speaks some English and the two of them listen seriously to my story before consulting amongst themselves. Nearby is a tow truck. I'd heard of a service that assists tourists. Commonly called "Green Angels," up till this moment, I hadn't seen one. The 'mechanico' and myself jump into the truck and head back to my van. He speaks no English. And I no Spanish. We're able to communicate perfectly. We both hope it's the fuel filter, though we're both doubtful. He gets out tools that I also have, and much more easily than I, takes out the filter. I get in the van. The engine starts immediately. We're victorious. He agrees to drive behind me for a few kilometers up the road to make sure the problem is solved. It is. We wave goodbye. In the next two days of driving, I never see a Green Angel again. After our morning walk, I hear gun-fire. Someone doing target practice? This is a sound that's interrupted so many good camping spots in the US. Later in the morning, a 65 year old Texan pulls by the side of the van to check I'm ok. This man is a true Texan with brilliant blue eyes that emerge from underneath a well used cowboy hat. He's incredulous of my travels. "Well, it takes all kinds to make a world, I suppose," he says. "Thank goodness there's people like me around..."
"...who'll stay in one place to grow the food," I finish. "Yup, I completely agree." I like the man. He has a good feel about him. He tells me of a neighbor who has about $3 million in stuffed animals in his house, many from Africa. "I'm not into huntin' myself, but this man's place looks like a museum." "From what I gather, when men get older they're less interested in hunting." "Yeah, I think you could be right." "I did hear shots this morning, from over there." "That could've been me. I got a coyote." "No, just cattle. Just something about coyote...I just don't like 'em. Don't know what it is." I'm sad. One of the coyotes I'd heard, now dead. "Well, I better be going if I'm going to cross the border today," I say. "Yeah, who knows what might happen if you don't make it today," he says. I catch an element of irritation in his voice. After four months of city living, I realize I'm still in fast mode-and he's not. I drive the remaining three hours to the border filled with apprehension and fear. This is the moment I'd been anticipating for so long. And I will go. But I don't want it to be like this. I try and figure out what is the source of my fear. It's communication. Whilst travelling in the US, my cell phone connected me by voice to friends, and as a modem to the world of internet and email contact. Once I cross, I will no longer have that privilege. The rates are too expensive. I'll have to rely on internet cafes where I can find them, and give up the luxury of emailing from the privacy and convenience of my van. And no phone conversations. Or very few... I fear being isolated. When something goes wrong, who will I turn to? No longer will I be able to pick up the phone and share my woes. This, not security and physical danger is what I fear. The town of Phalo next to McAllen, Texas is, like many border crossings, not a great place to spend the night. I'm about five miles from the Mexican border. There are no RV parks, and no campgrounds. But it's getting late and I'm not mentally prepared to go into Mexico. I don't want to go into a hotel and leave my van unattended. I drive around and find a dirt road that follows a drainage canal that goes through some farmland. I find a small grove of trees to hide the van, if one can actually hide a large white Chevy van. We're next to spot used to dump garbage. I can hear the roar of traffic on the other side of the canal. In the other direction is gunfire. Someone doing target practice after work. But huge herons fly across the fields and into the waterway that's laden with garbage. The long-legged birds are exquisite. I leave Houston about 1pm amidst many hugs and a few tears. I've spent four months on and off with this family-mostly on. It's been intense, and good. It's difficult leaving, much more difficult than I'd imagined it would be. As I drive down I-45 the feeling I'd expected, that larger than life, exhuberant I'm-on-the-road feeling doesn't happen. I feel empty and a bit lost. Even knowing there's a possibility of meeting friends from Arizona on New Year's Eve in the town of San Miguel de Allende doesn't help. I drive far too long for a first day, and feel sorry for myself almost the entire five hours. After sun-down I'm in Kingsville, home of the largest cattle ranch in Texas. I find a spot about a quarter of a mile from a garbage dump down a empty country road. The dogs and I walk down down a dirt track and hear an owl and coyotes-our first in months. Bruiser and I are elated and he runs in the open fields under cover of darkness before returning when I cook lamb for dinner.